NEW YORK (CNNMoney.com) -- In the wake of Thursday's iPhone 4 launch frenzy lies as trail of unloved, no-longer-needed iPhones cast off by owners trading up for the shiny new model. Analysts estimate that as many as 1.5 million iPhone 4s were sold on the first day -- and three-quarters of them went to buyers upgrading from a previous iPhone. That means more than 1 million iPhones are headed for the graveyard. Where do old iPhones go to die? Some, inevitably, wind up in the trash or the back of a junk drawer. But many find their way into the secondhand phone market. On Friday morning, more than 5,000 iPhone 3GS units were available on eBay (EBAY, Fortune 500). Companies that buy, rehab and resell old mobile phones and PDAs are having a bonanza right now -- it's Christmas in June for sites like like NextWorth, CashforiPhones.com and Gazelle. "It's always a good time of year for us," said Dave Chen, CEO of NextWorth. "Every day we're hitting record numbers -- several hundred to probably over a thousand [units] today. We'll probably end up doing over a million bucks this month just in iPhones." Chen thinks that business boom will continue as more customers make the move to the iPhone 4. "It's one of those no-brainer upgrades," he said. "The new ones are subsidized quite heavily by AT&T (T, Fortune 500), and it's a phenomenal new phone." IPhones hold their trade-in value better than most aging electronics. NextWorth pays an average of $200 for a 16 GB iPhone 3GS in good condition. That's also what a brand-new 16 GB iPhone 4 costs -- but only with the subsidy AT&T offers to buyers who take out a new, two-year service contract. Buy an iPhone 4 without the contract, and you'll pay $599 for that 16 GB phone. If iPhone owners break or lose their phones before their contract is up, they need to buy a new, unsubsidized one if they want a replacement. The phones' stiff list prices, starting at $499 for an 8 GB model, drive many buyers to the secondary market. The result: Brisk demand for used iPhones in good condition. A now-outdated iPhone 3GS can still fetch $300 to $400 on eBay. Once it buys a phone, NextWorth wipes the data, does light refurbishing work, and resells the phone on the secondary market. Some go to wholesalers and insurance companies, while others are listed on eBay or Amazon.com (AMZN, Fortune 500). NextWorth also snaps up broken or damaged iPhones. "There's a large market for folks that just want the parts," Chen said. "We're trying, as a company, to divert goods away from the waste stream and keep them from ending up in a landfill." Rival recycler Gazelle has purchased 17,000 old iPhones from customers since Apple CEO Steve Jobs announced the iPhone 4 on June 7, spokeswoman Kristina Kennedy said. Gazelle took a direct approach to cashing in on the iPhone 4 mania: It sponsored notorious first-in-liner Greg Packer, who led the flock of campers waiting for days at Apple's flagship store on Fifth Avenue in New York City. The company paid Packer $250 for each day he spent in line, wearing a Gazelle t-shirt. "It's been a pretty exciting time for us," Kennedy said. "Usually when the iPhone comes out we always see a really strong spike in our business." But this year, it's on a whole new level. Gazelle got around 150 trade-ins a day last year when the iPhone 3GS came out. Since the iPhone 4's unveiling, the average has leaped to 1,200 a day. More than 90% of the iPhones Gazelle buys are in good condition. They're then resold at retail outlets like eBay, Amazon.com and Overstock.com. Broken iPhones are resold to wholesalers. "Broken iPhones are one of the few products that still hold value because the parts are so valuable," Kennedy said. Gazelle pays about $50 for a dead one. For those who aren't looking to cash in and simply want to send their iPhone on to a happy retirement, charitable donation is an option. 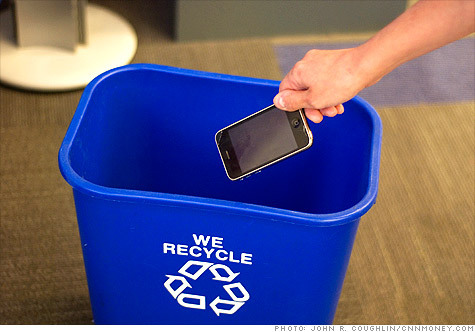 Steve Glinberg, developer of educational apps like KidCalc Math Fun, runs a recycling program for iPhones and iPod Touches. Glinberg wipes the data, restores the factory settings, installs educational apps and ships the devices to teachers who have requested them. "IPod touches and iPhones are invaluable to teachers, and are being used more and more in classrooms as teaching tools that draw kids in and engage them in a way that other teaching tools and text books haven't," Glinberg said. "Every day there are more and more apps in the App Store's education category." It's a whole new twist on giving the teacher an Apple.